So who is actually on the highland-dance mailing list? Maybe you can get an idea from these potted histories. I am eighteen years old and have been dancing since I was three. I do tap and Jazz but my main thing is Highland. I live in East Kilbride, which is just outside Glasgow, in Scotland. I am member of the Kilbryde Dancers and my teacher is Myra Miller. I am an associate member of the SDTA, Highland Branch. My mum is a dancing teacher and also a SOBHD judge. I compete at Championship level at competitions throughout Scotland. I have competed at The Interprovs in Montreal(1993) and London(1995) and at the American Inters in Texas(1996). Karen can be contacted at kazarthur@callnetuk.com. I was a highland dancer as a teen and at Queen's University, but did not start "seriously" dancing until my daughters Genny and Kary started dancing. I started dancing (at age 32) with Genny, and stayed with it after she left for other pursuits. I did my Highland medal tests up to the gold level, and my nationals up to gold bar 2. I also assisted in teaching and danced with the performing group until I "retired" at age 43. By profession, I am an Occupational Therapist and epidemiologist, now doing freelance consulting work. I love watching Highland, and now that Kary has started Irish dancing as well, I enjoy going to competitions and feis around the Ontario and Northern New York area. My daughter Kary (in the picture, in the Irish dance outfit I made for her) dances with the Rob Roy Highland Dancers, and has just reached premier. This picture was taken at the Rob Roy Visitor's Centre in Calendar, Scotland, on a tour in August of 1998. Mary Lou can be contacted at ml-b@cgo.wave.ca . I am a software engineer working for Indigo Active Vision Systems, who design boards to allow CCTV cameras to communicate and be controlled over computer networks. I do a lot of Scottish Country Dancing, and have just started teaching as well, having inherited the class from a friend who got a job in France at very short notice. I would like to think I am also starting to make a reputation as a dance devisor. I run the Grand Chain Scottish Dance website, and I am also the instigator and administrator of the highland-dance mailing list. 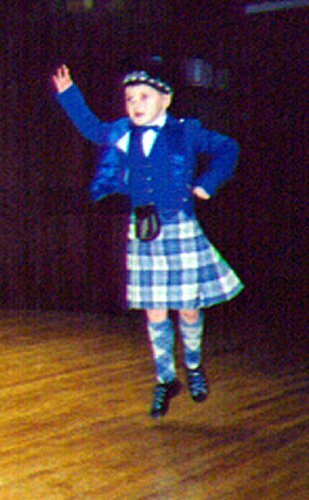 My highland dance experience is limited to a couple of years tuition while at university, and the occasional Fling or Foursome and Half Tulloch as a change during an SCD performance - I would not consider myself an expert by any stretch of the imagination. I can be contacted at ian@scottishdance.net . I started dancing when I was about 4 and continued until I was 12 when I broke my leg very badly. I started up again about 3 years later and started getting placed and moved up quickly. I am studying Travel and Tourism, in my first year and I am in a Pipe Band, Derwent Scottish Pipe Band playing the sidedrum. 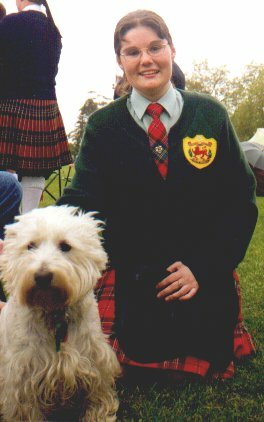 This photo was taken on our band trip in December 1998 to Daylesford, Victoria, with a dog that I met. Alex can be contacted at campbell_alex@yahoo.com.au. Hi my name is Bronwyn Chhay. I hope you like my picture. That was a primary competition that was in the mountains. I am in grade two now and I don't work yet. I just help my Mom and bug my sisters. I do highland dancing and I like it. I am learning the jig. I like my highland teacher but she makes me work so hard. I am a novice dancer but I will be intermediate soon [too soon says Mom who will not compete for a while!] When I grow up I want to be a teacher and maybe I will still dance. My mom says Emily is like tigger because she is bouncy. That's all I have to say. I can do a pas de basque and I have horrible feet. I dress dancers and help them on their quest to find beautiful dance clothes at reasonable prices. I hail from Montreal area, Quebec. I'm a first generation Canadian with family from Glasgow and Firth of Forth areas. I've never been to Scotland and never met any family other than a cousin who is in Kirkwall. I have a BA in Equine sciences and would have liked to study entomology more but I ended up giving birth to 3 bugs. They are Vikki, 19, Alexandrina, 14 and Bronwyn, 7. The eldest sub-teaches dancing; her knees are not healthy. The 14 year old is an active compeditor in Highland and also ballet. The 7 year old just wants to be better than the 14 year old. I was a Records Management Archive specialist with a large oil company, however that is a service which is no longer employed by that company. I now am a free lance costume specialist! No pay, no holidays, on call 24 hours to parts unknown. I enjoy all of the people on the highland dance group, and like reading about far-away dancers too. I don't contribute an awful lot but I still enjoy the exploits! There is nothing in the world to compare to the beauty, strength and grace of a highland dancer. I have been known to bore people to death on the subject of tartan and beautiful dance feet. Sue can be contacted at pict41@hotmail.com. I'm a stock broker by trade and have specialized in macro economics and corporate finance. On the lighter side, I have my own highland school which I run with the help of a partner. We are the Ceilidh Highland Dancers. 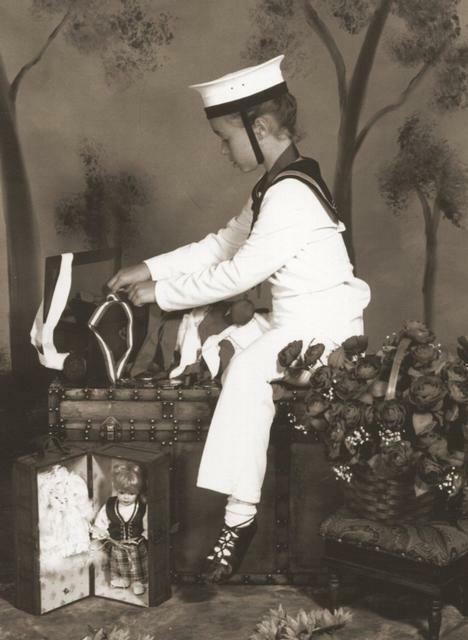 I began dancing at the age of 3 and continued competing until I was 18. After completing school, getting married and having 2 kids, I started teaching highland. My son, David just turned 6 and has competed in one competition. I've enclosed a picture of David at our Christmas show. He is certainly making me proud. My 4 year old has just started learning to dance and may compete this summer too. I competed in my last competition last year to celebrate David's first comp. Something I promised him I would do. Due to health concerns, I no longer dance but can still teach with a passion that would be difficult to match. I look forward to meeting the members of this list as the years go on. Stacy can be contacted at stacy@golden.net. Hi there, my name is Ceilidh Josephine and my mummy is a Highland Dancing Teacher, Adjudicator and Examiner in Australia. I was born on the 1st April 1999 and this photo of me was taken at Campbelltown Competition when I was 7 weeks old. Don't you love my dancing shoes!!! I am going on my first trip to Scotland this July! My aunty, Casey Banks is dancing there. Maybe I'll dance there one day too! Justine can be contacted at highland@sydney2000.net. I began dancing at the age of 10 in Kansas City. I have studied Highland under teachers Jean Forbes, Betty Lawrence, & Sheena MacDonald. The majority of my instruction was under Sheila Mittig in Detroit from whom I began taking lessons in 1973. Upon graduating High school, I attended the Univ. of Iowa and Univ. of Missouri/Kansas City where I obtained my BA degrees in Physical Education/Health and Dance. For several years I taught Highland, Ballet, Aerobics, Physical Education, and Gymnastics in various school systems and studios while relocating with my husband every 2-3 years. I am a member of BATD and have been teaching Highland for over 20 years. I now devote my time to Highland X Press, my family, and spending too much time on this list. 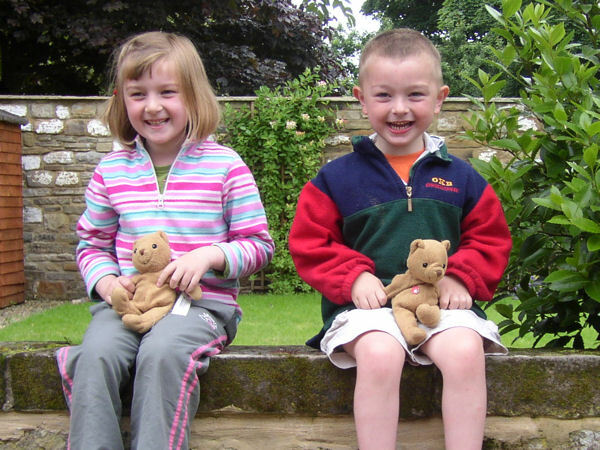 I have two children: Shavonne age 11 and Sean age 7. Sean takes Highland and will continue to dance as long as he enjoys it, or until his mother gets fed up and kills him. MaryBeth can be contacted at HighXPress@aol.com. Emily is one of the more enthusiastic contributors to the list, as shown by the number of tips she has contributed. 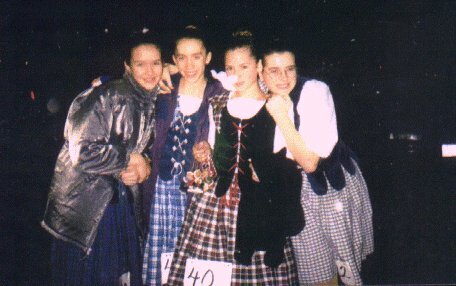 She is seen here with Gwyn, Katherine and Hilary after the BC Highland Fling Competition in December 1998; Emily is the one on the right). 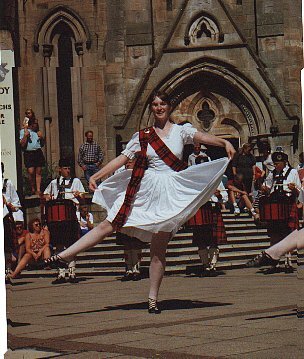 Bobbie was Unit Manager for the St. Andrews Society Highland Dancers in Springfield, IL for 3 1/2 years and editor of the program for the Springfield Highland Games & Celtic Festival for the past 4 years. 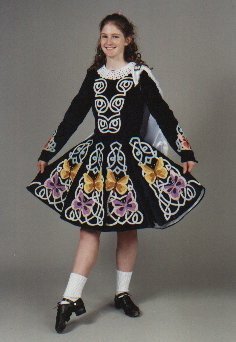 She now makes kilts for Highland dancers, pipers and athletes as well as does costuming for Highland dancers. See her article at: http://www.scottishdance.net/highland/MakingKilt.html. Her daughter, Kimmy Suttie (in the photo), is 10 yrs old, has been dancing since 5, and is entering her 5th year of competition. 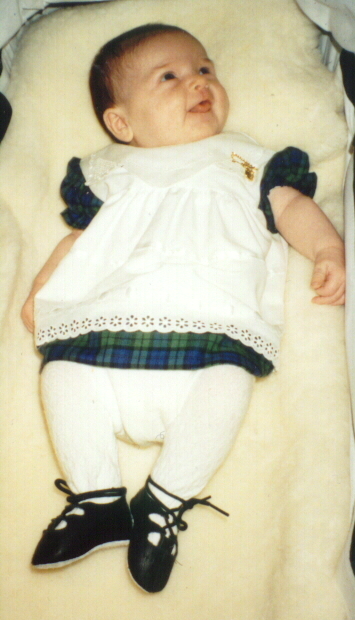 She is now Novice level and performs with both St. Andrews Society Highland Dancers and Justin Dancers. Bobbie can be contacted at BSuttie@springnet1.com. I have other pages for Scottish dance in general, Scottish country dance, Ceilidh dance and Scottish music. Return to the "Grand Chain" Scottish Dance in Edinburgh home page.